At Dogs Naturally, we’re both saddened and amused when surfing through veterinary clinic websites. We decided to post a Top Five List of some of the just plain bad vaccine advice commonly dispensed by vets. Here are some real snippets of wisdom, pulled off various veterinary websites. The body doesn’t react to a vaccine the same way it would to the real disease. When exposed to a real virus, the body forms immunity by filing that information away in memory cells. The memory cells, called cellular immunity, are responsible for mounting a quick attack the next time they are faced with the same disease and the body, armed with the knowledge the memory cells have stored away, quickly neutralizes the disease by triggering circulating antibodies. This is why humans only get chicken pox once and dogs can only get parvovirus once. After the first episode, they’re protected for life. Vaccines try to emulate this, but they don’t do a complete job. Vaccines stimulate circulating antibodies, called humeral immunity, and they bypass the memory cells. This creates an artificial immunity called humoral bias and this essentially turns the immune system inside out. To learn more about this effect, read our article on Vaccines And The Immune System. But the real problem with this statement is their desire for antibody levels to be high. High antibody levels mean high levels of circulating antibodies – or humeral bias. The higher the titer, the more chronically inflamed the body is. This humeral bias and resulting chronic inflammation result in many of the autoimmune diseases we commonly see in dogs today: allergies, cancer, arthritis, diabetes, bowel disease and many, many more. Vaccine reactions may be rare, but the risk and severity of chronic disease that vaccines cause increase with each and every vaccine given. Vaccinating a puppy at 6 weeks? According to veterinary vaccine researcher Dr Jean Dodds, only 30% of puppies will be protected from a vaccine given at 6 weeks of age. 100% of them will be exposed to disease when taken to the vet clinic for that shot. So, choosing to vaccinate a puppy at 6 weeks means exposing him to the most disease-ridden location he could possibly be in – the vet clinic – while creating immune suppression at the same time. Your puppy is much more likely to get the disease he is being vaccinating for, and all in exchange for a 30% chance the vaccine will work. We also object to this statement: “This course must be completed before your puppy is fully protected.” There are two problems with this statement actually. You can’t be partially protected: immunity is like being a virgin, you either are or you aren’t. Either the immune system has filed that information away or it hasn’t: there is no grey area, you are either immune or you are not. As for the other problem, a course of vaccines is not necessary: it only takes ONE vaccine to protect a puppy – ONE AND DONE. For more information on this, you might want to read Taking The Risk Out Of Puppy Shots. Wow, bad grammar aside, there’s one very big problem with this statement – a monumental problem of biblical proportions! Not only do core vaccines last for years, some for the life of the animal, vets have known about this for about forty years! We won’t even go into why annual vaccination is a very, very bad choice – because vaccinating every three years or every five years is also a bad choice based on unsound science. Why would you vaccinate every year if the minimum immunity starts at 7 years? Why put your dog at risk? Think we’re making this up? You might want to read Lifelong Immunity: Why Vets Are Pushing Back for more information. Controversy? Industry leaders and experts? Here is the crux of the problem: these vets are waiting for the vaccine manufacturers, AAHA and the AVMA to decide how often to vaccinate. Don’t you think that all of these entities have a financial interest in how often you vaccinate your dog? Are they capable of making an unbiased recommendation? Tailor vaccination protocols to your pet. While some vaccines, like rabies, are required by law because of the risk to humans, others may be necessary for your pet’s lifestyle. In some scenarios, a titer to previous vaccines can be measured to help decide if a booster vaccination is necessary. Your veterinarian will know what’s best for your pet. 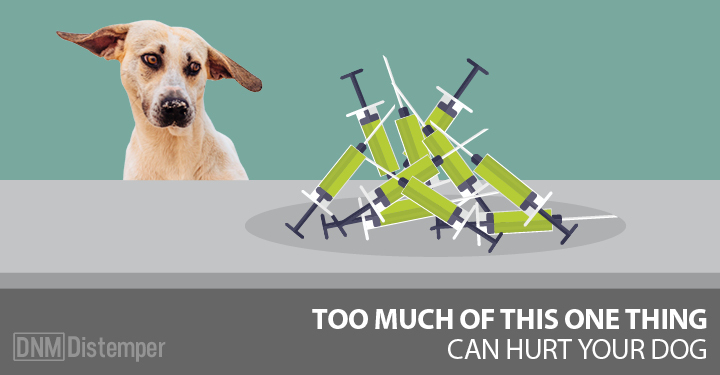 Any vet who advocates annual vaccinations – or even uses the term booster – is clearly not expertly trained in immunization or the welfare of your pet. Perhaps that’s because immunity is taught by the vaccine manufacturers. It’s no wonder that vets are well armed with needles yet lack the knowledge or motivation to question just what damage those needles are doing. And even if they acknowledge the research that proves annual vaccines are unnecessary, most are not willing to lose the profits those yearly visits bring in. If you would like to learn more about how little vets feel they were taught about vaccination, and the diseases they’ve seen vaccines cause in their patients, read our ground-breaking featured article, Vets On Vaccines.